WhooHoo of Genesis (AHR 31443-10) was born March 12, 2010. This flashy, big-moving colt has already been gelded and has great potential as a future performance gelding. WhooHoo is sired by the imported, AHR Silver classified stallion, Windstar van de Ooste. Windstar’s maternal line is one of the best Holland has to offer and this line boasts athletic mares with great movement. These genetics in Windstar’s pedigree certainly contribute to the lofty gaits of his offspring. WhooHoo’s dam is the Austrian imported mare, Ulma. Impressively, as an 11-year-old mare that had already raised multiple foals, Ulma was AHR silver classified in 2009 with 77 points. 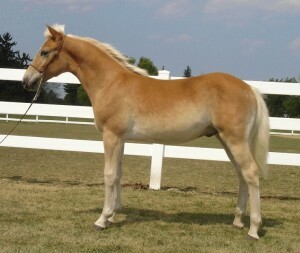 Ulma is sired by the famous and former Reserve World Champion stallion, Alpenstein. Ulma passes on strong movement and a forward moving attitude to all of her offspring and WhooHoo is no exception. WhooHoo started his show career off with a bang! At the 2010 GLHA Futurity, he was the first place weanling colt in a very competitive class. At the 2010 AHR National Show, WhooHoo placed 2nd in the ‘Weanling Stallion/Gelding’ class. WhooHoo is offered for sale to an approved performance home. With his flashy looks, bright color and strong lofty movement, he will be a solid contender in the riding classes.